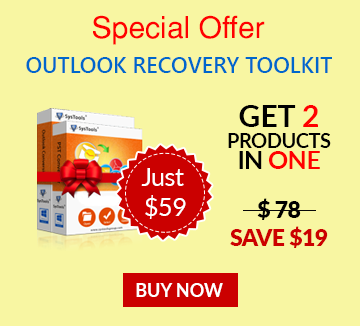 Outlook is a desktop mail client introduced by Microsoft that not only offers the provision for emailing, but also for storing personal information like; contacts, tasks, notes, etc. So, there occurs the problem in storage space. 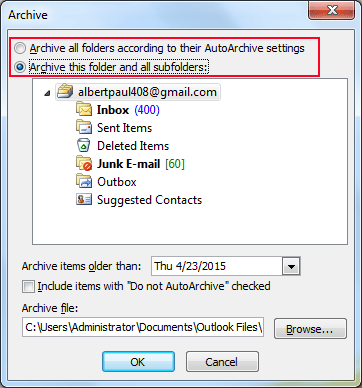 Thus, to manage storage space, Outlook provides the feature of Archiving data. Archiving is a process where the data of current PST file is divided and stored into a newly generated PST file at a default/user selected location, to create more storage space in the currently used data file. One can archive any of the Outlook storage, i.e. emails, contacts, or calendar, etc. In Archiving, important data that is not currently being used by the user is stacked away in a separate PST file thus, making room for more data. Outlook mailbox size increases by the regular exchange of messages. Thus, slowdown in the performance of the Outlook occurs. For maintaining the client performance, Archiving feature is provided as a medium of data management by Microsoft in Outlook. 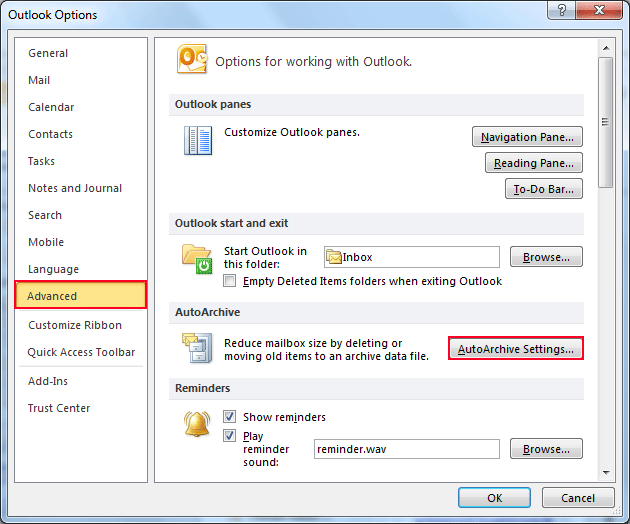 Archiving reduces the size of Outlook Data File letting users deal with storage or slowdown related issues. There are two types of archiving– Manual Archiving and Auto Archiving. In Manual Archiving, the user must select the folders that are to be archived. It is more flexible than Auto-Archive because it allows specification of folders. 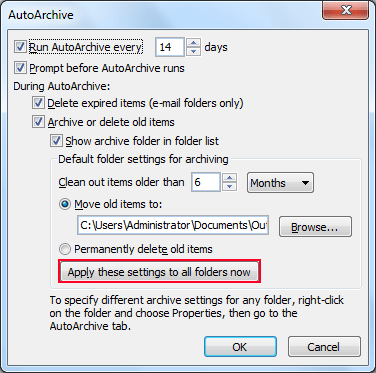 Auto-Archive process does the work automatically once the user has specified when to start the archiving, however, complete data file is considered for archiving instead of selecting folders. Where Do Files Get Stored? For different Windows OS there are default locations. 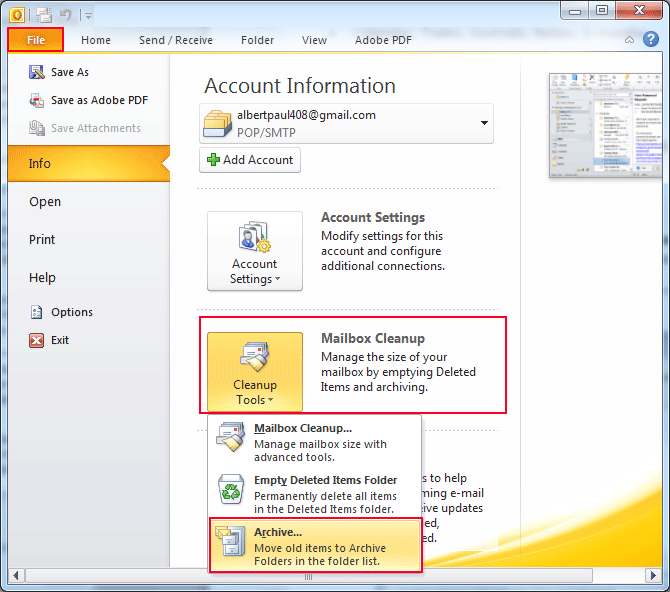 Click on the "File" menu and select "Mail box cleanup option". After that Select "Archive" from the drop down list. Archive dialog box appears with two options. "Archive all folders according to their Auto-Archive settings"
"Archive this folder and all sub folders"
Select the radio button accordingly. If second radio button is selected, user has the choice of selecting folder(s) to be archived. 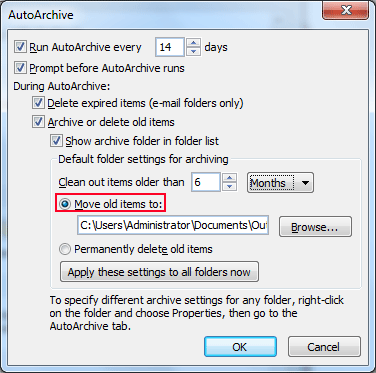 Specify the date, items older to which must be used for archiving:"Archive items older than:"
Put a tick on the checkbox to archive those items that are excluded from being archived in Auto-Archive settings, if needed. Click on "Browse" button to change the default location to a path of your choice. Click on "Ok" to proceed archiving. Click on "File" menu and select "Option" from the drop down box. Option dialog box appears. 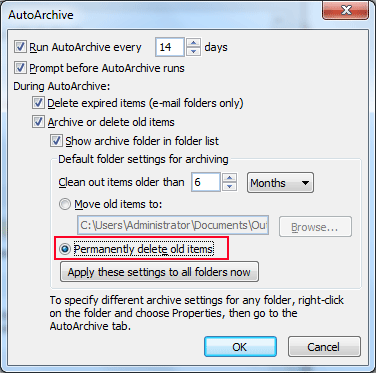 Select "Advanced" option and Select "Auto-Archive…". 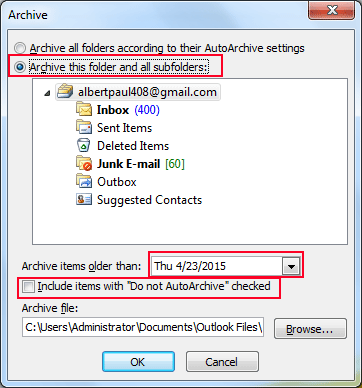 Auto-Archive box appears. 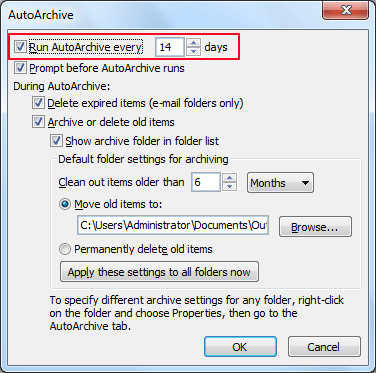 Put a tick on the checkbox that states: "Run Auto-Archive every-days" and change the number of days for Auto-Archiving to proceed. 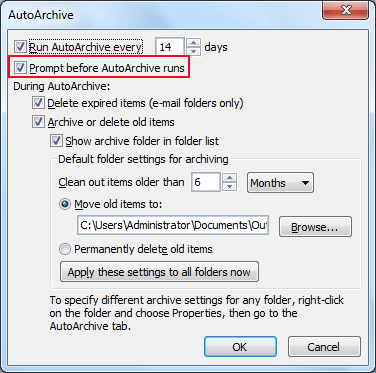 If you want to be notified about archive, click on the checkbox "Prompt before Auto-Archive runs". "Delete expired items(e-mail folders only)"
"Archive or delete old items"
"Show archive folder in folder list"
Choose according to the requirements. 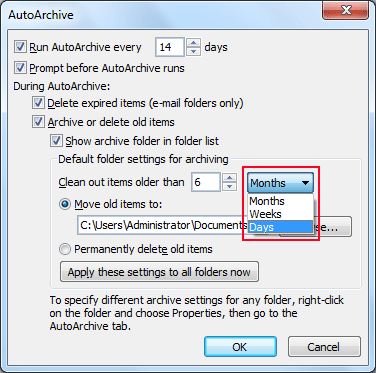 Choose the number of months, weeks or days items older to which must be cleaned out by Outlook. Either click on the radio button "Move old items to" to move items to the default location or to the one you have selected for storing the archive output. Click on the radio button "Permanently delete old items" to remove old items. NOTE: If the user wants to specify settings to specific folder then, right-click on the folder, choose properties, and go back to Auto-Archive. For applying changes, click on "Apply these settings to all folders now". Click on "Ok" button to proceed. NOTE: All versions of Outlook have the same Archive property but, the only difference in finding out Archive dialog box. Conclusion: Microsoft Outlook is a like an email application but it is a desktop mail client. It even offers other personal information like; emails, notes, contacts, journal, etc. 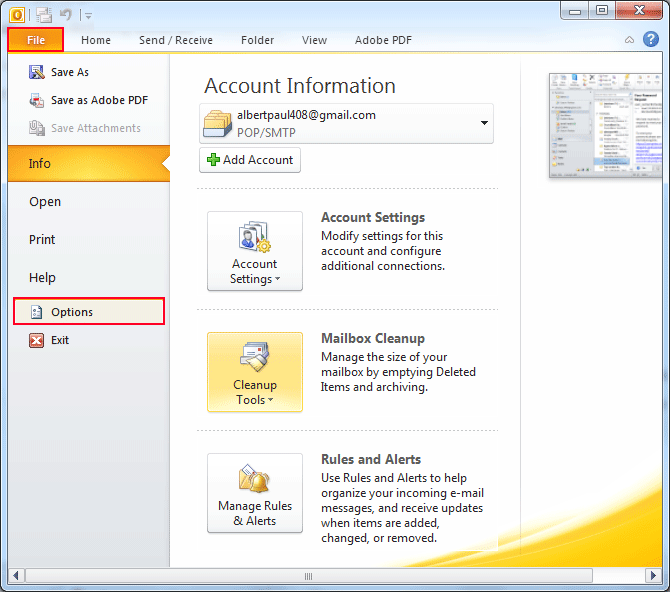 The feature Archive provided by the Outlook allows the user to separately keep a copy of those emails, notes, etc., which are important but not used so far. Thus, the problem of slowing downing performance of Outlook is resolved as a result.